All great works of art bring out strong emotions. You cannot stay lukewarm about them. They will either be loved greatly or hated thoroughly. I watched Piku yesterday. Shoojit Sircar comes out with a winner. Well, he crafts and weaves a world of Bengali mind and paints masterly how a Bengali views the world. Every state has its own nuances and Shoojit captures the Bengali perspective masterly. But that is not a credit. What would a Bengali do, if not capture a Bengali character well? Kolkata has largely stayed stuck in the time-warp with its old world charm intact, if you leave Salt Lake part out of it. Even in the New Kolkata part, the character of old Kolkata lingers on as at the first hint of cold monkey caps come out. This makes it easier to invent older time Kolkata on the screen, especially if the director is a Bong. The movie gets most of its credit for the subject it touches. It looks at the older people and at the risk of going against public idea of morality, is also sympathetic to the young who bear the brunt of the moodiness of the old. But then, the story follows a delicate balance. It tells what it wants to tell. It doesn’t largely take sides. It narrates, without judging which is to the credit of story writer. It is full credit to Juhi Chaturvedi, who wrote the story and screenplay of the film. It is always very possible for a writer to take a position and fall into the trap of becoming a judge instead of being a neutral narrator or story-teller. Juhi has always been a great watcher of people, looking at patterns. We watched it first in Vicky Donor she brought out Lajpat Nagar so vividly in her words and pictures. She touches those caricatures, those cultural ethos of CR Park here in Piku with rare softness. Bhaskor Bannerjee (not Bhaskar) lives in CR Park, the mini-Bengal in Delhi with his Architect daughter, Piku. He is a forward-thinking man and a man who speaks his mind. He believes marriage is something which ‘Low- IQ’ women do, even in the context of his own, now-dead wife, who he blames for having put her own needs, wants, dreams and choices subservient to Bhaskor. He lives with his thirty year old daughter, Piku, Deepika Padukone. Bhaskor a hard-headed, even if forward looking man, is not much liked by those around him. Bhaskor, in his seventies is a hypochondriac and is not much liked by people in his household, due to his plain-speaking and hard-headedness. Piku, his daughter is an independent minded, but duty conscious daughter of his. Old age is a continuous effort to remain relevant; and the fact remains, that the less the effort, the more graceful the aging. However, Amitabh from the very beginning is not in a bit obnoxious, except for in very rare patches. Mostly he comes across as affable man with naughty tinkle in his eyes. He is true reflection of Terry Pratchett's words, “..inside every old person is a young person wondering what happened” and even his hypochondriac nature finds resonance in Hemingways, “No, that is a great fallacy: the wisdom of old men. They do not grow wise. 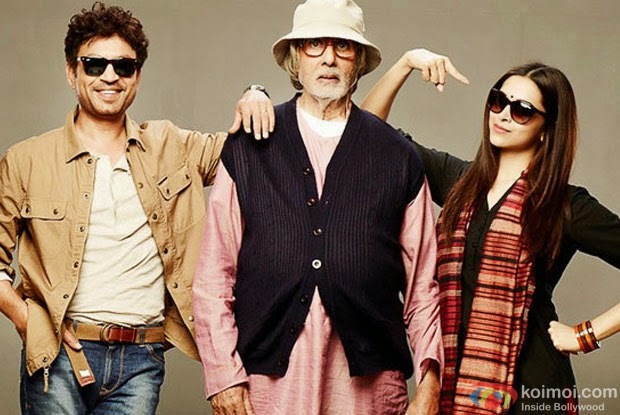 They grow careful.” Well, Irrfan as the owner (rather the son of the owner)- phlegmatic, prudent and troubled by tempestuous tempers of beautiful Piku, who agrees to drive the father-daughter duo from Delhi to Kolkata is Hemingway here, who fearlessly, though with some nervousness, points out Bhaskor’s own old-aged selfishness to him. The film doesn’t fall into the usual traps. It treads treacherously close to becoming an Irrfan-Deepika love story, but no, the story escapes the usual narrowly. A plain, charming story of a father – daughter duo, this movie remains just that, full of wit. If wit means Oscar Wilde or Sharad Joshi and you cannot be easily pleased with fat man slipping over a banana peel on the road, this is movie you will love. Timing is an important element of the wit, otherwise what is humorous about the wry retort by ‘Non-Bengali Chowdhury’ Irrfan to Bhaskor’s translation of a bangla song ‘Ei Poth Jodi Na Sheh hoi’ translating to “What if this road doesn’t ends” that “Aisa gana gao jiska koi kaayde ka meaning ho (Sing something sensible rather) ” and points to the silliness of intellectual narcissism. He laments as to why parents at time feel it is alright to emotionally blackmail their kids who on their own are trying best to take care of them, offering possibly the first emotional release to all the pent up anger of the righteous daughter. Death can mean many things. It depends on how you look at it. One can be scared of it, enchanted of it, or one can be matter-of-factly about it. It also obliquely tells that most of the difficulty, self-centeredness of the old arise from their own fear of old age and death and at times, they are haunted by their own ways when young. If their strength in youth gave them the confidence to turn away their olds and their young, being unkind to them; they fear the same may come about to them when they are weaker. 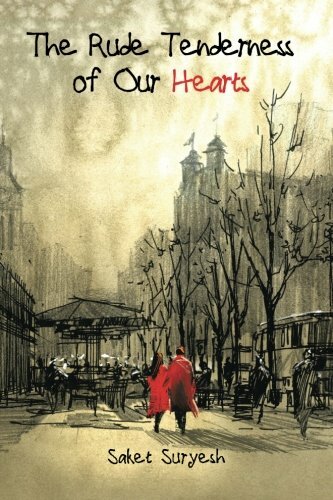 Their own past haunts their future as debilitating old age is around the corner. Death is inevitable and it will not be traumatic if one approaches it without fear, with a degree of dispassionate acceptance. If you always had trouble embracing life unless it conforms to your desires and plans, you will have trouble embracing death as well, inevitable as it might be. Death and life after all, are interlaced to one another, as Bhaskor discovers cycling down the lanes of his city, a day before he dies happy. He is able to discover happiness inside, not wanting his daughter to establish happiness for him, learning to be grateful with what he had, his loving, even if busy daughter, his brother, and his beloved, Champakunj. The movie has amazing message, brilliantly written and amazing actors lifts it up further to the point where high literature touches public minds. My Rating: Not to be missed at all. Disclaimer: Being father to a seven year old only daughter might have biased me in favor of the movie.